He/she who has no experience with skiing, he/she starts with bases of mini skis riding, i.e. 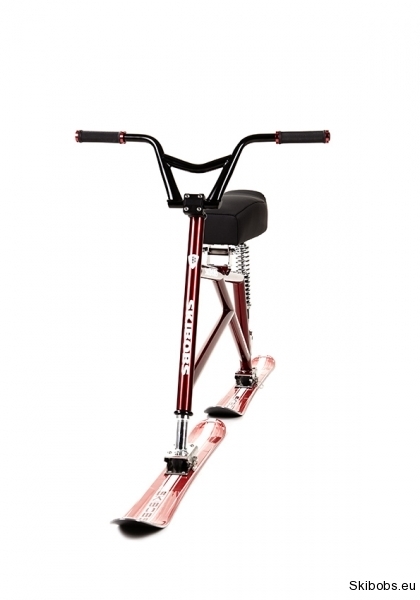 slow downhill riding, curves, slip braking, ride on the ski tow and standing stability. This all without the skibob. This is very simple and funny stage. 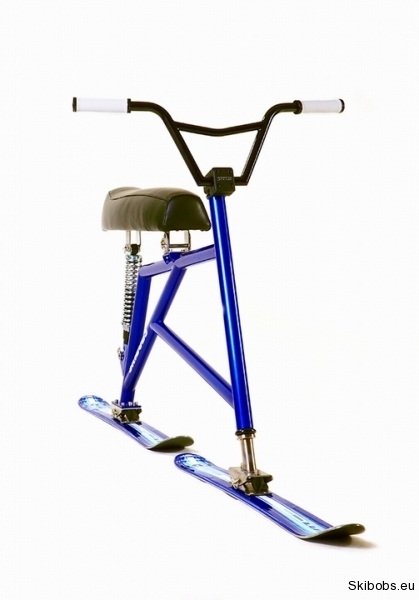 The ride on mini skis is very similar to skating. 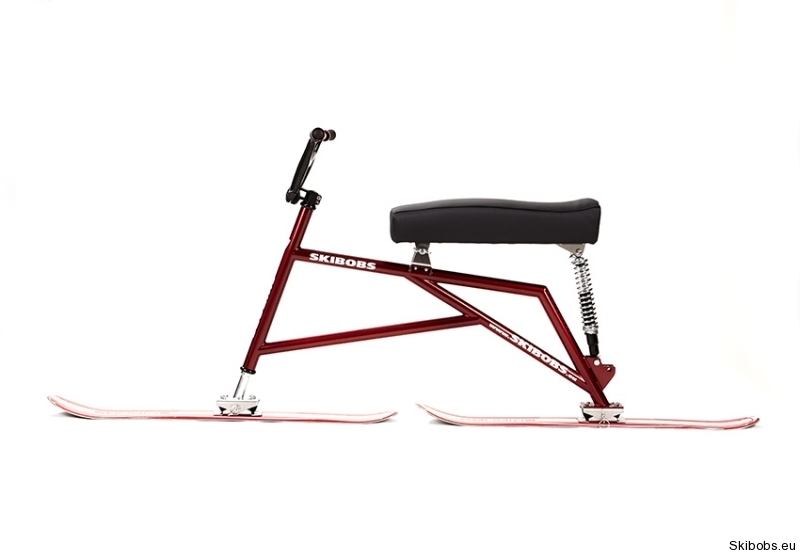 Those who have basic skiing skills can start right with the skibob. Attention! Always start with the skibob at the slight slope! There are no limitations on the slope; you can use any ski tow, bench or gondola. – On the bench keep the skibob put on the barrier or your knees – thus you occupy more than one place provided the traffic is not too busy. 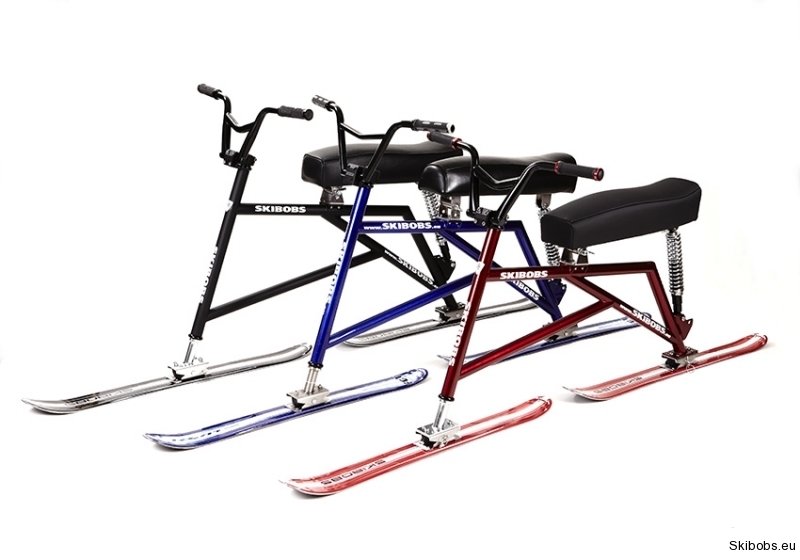 If more skiers go up, sit only on the edge seats with your skibob. Always keep the skibob with one hand at least to avoid its fall down from the bench tow! 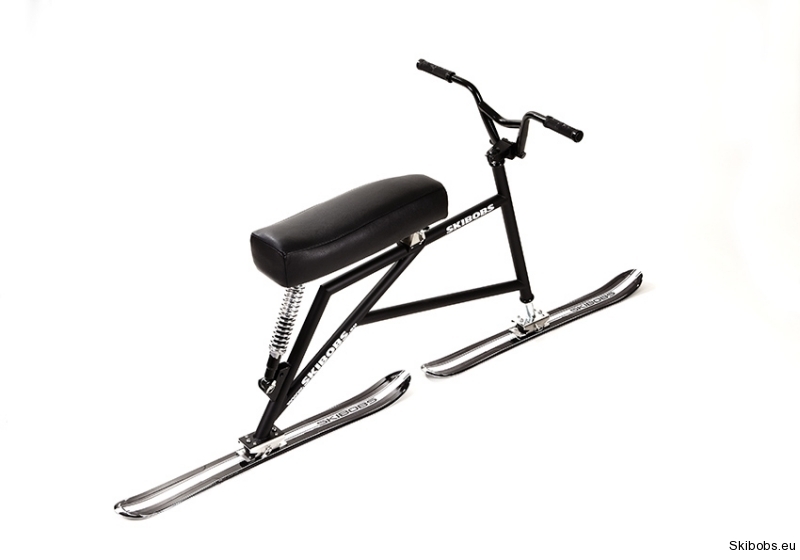 Sit comfortably on the skibob, seize the handles (like on the bicycle) and straddle away your legs. (In the curves, the inside leg serves as the support. 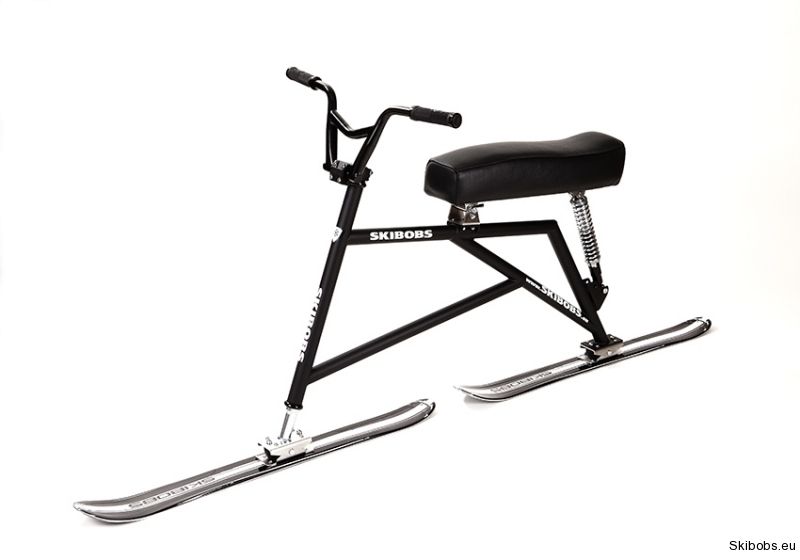 If you leg is too near to the skibob or really on the skibob, it cannot provide the necessary support in curving). This is very frequent fault of beginners; think on it during your ride. The same like in bicycling just use the handle bars and turn your head in the curing direction. It is very natural and simple. The skibob is obedient and goes where you turn the handle bars. For breaking, we use edges of the whole skibob (slip breaking) and at the same time we help with mini skis. We can also break in the snowplough style or with mini skis rear end. In no case lift the handle bars. It is necessary to be always leant on the handle bars. If you lift up the handle bars, the frontal ski can loose the touch with the slope and there is the risk of skibob side crash and fall. Go down the hill in slow curves. The riding speed in carving bows depends only on your skills and certainty. At the tilting into the curve, the rider body axe shall be in the skibob axe (the rider shall not tilt more or less than the skibob. When looking from the frontal view, the rider as well as the skibob shall be in one axe). On the steeper slopes where the carving ride cannot be used (the skibob speeds up too much, or there is not enough of space on the slope) we go down by drifting (slipping). This factor considerably influences the skibob manoeuvrability. 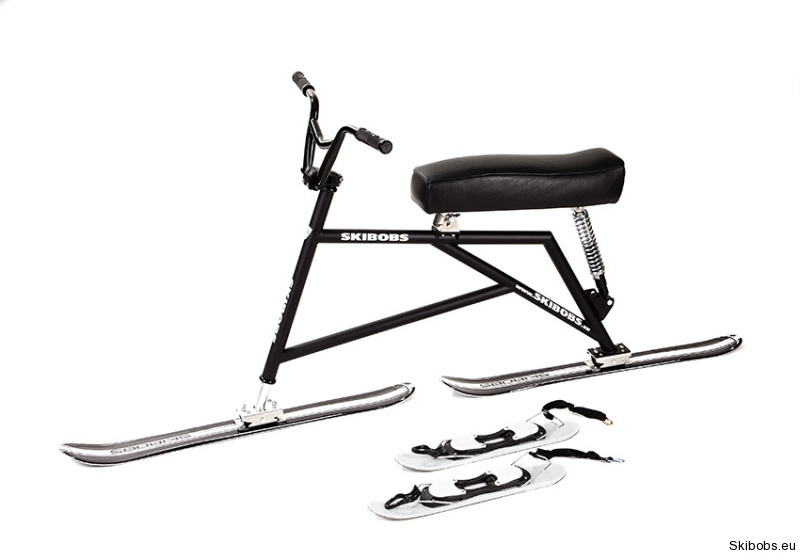 The seat has some recess to suit the rider during the whole period of skibob riding. The recess is intentionally only minor so that the rider can move back or towards during the ride and thus change the gravity centre and adapt the riding style to the actual needs. For example: if you move towards – your weight moves towards and the skibob is more willing to turn (slalom, quick drifting, difficult slope sections). Moving the gravity centre back is used for the rapid downhill riding. In the car, in the roof box or behind the driver’s seat. Assembled or disassembled. It depends only on you. The assembly after the total disassembly takes only 10 minutes (frame, seat, absorber and handle bars). But is it not always necessary. 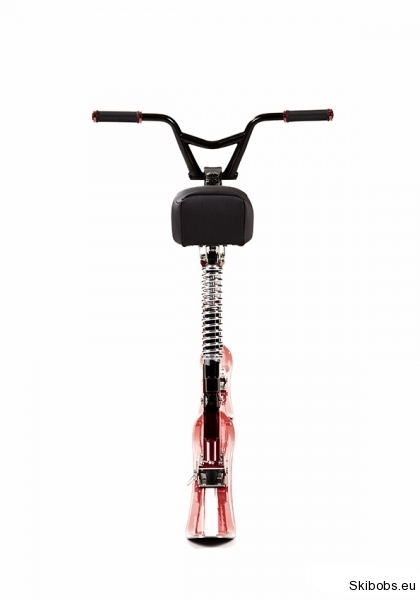 We recommend tilting the handle bars (to release two screws) – it takes only 30 seconds. Based on our experience, the skibob riding is very intuitive. That is why most of beginners is able to down the hill after 2 up 4 hours of training, this all in the speed and style of average skiers and snowboarders. At the beginning, please forget the black slope and get the certainty and skills before. 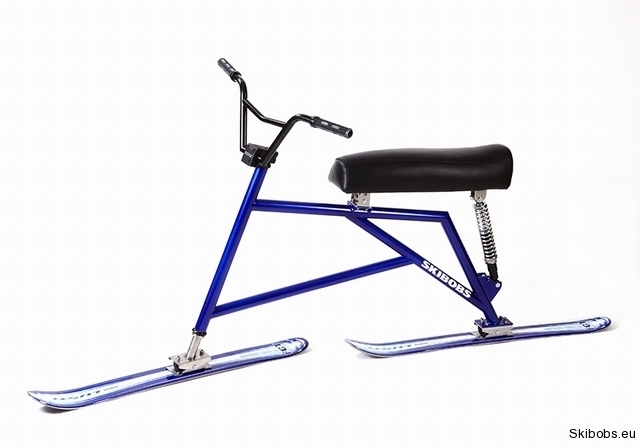 Please, be reasonable and regardful on the skibob. Think of your safety and of the safety of those around you. The majority of you weight is on the skibob, thus your legs are under the minimum load, and in case of any crash the risk of injury is less than in case of skiers or snowboarders. You surely do not intend to injure or endanger anybody. This won’t happen if you use your common sense and observe the rules for slope traffic. 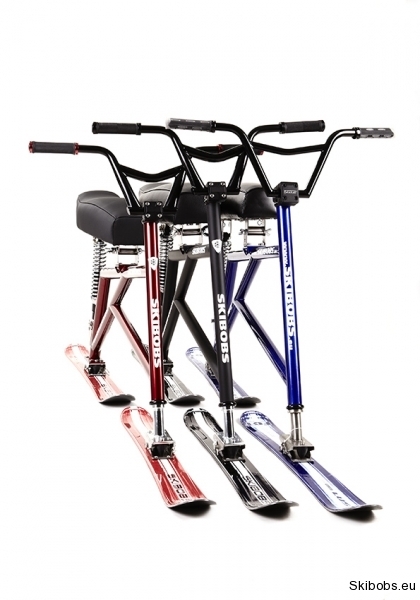 With its construction and the riding style the skibob mostly reminds of BMX bike. The philosophy of our concept is based on this similarity. To use and to combine the up-to-date knowledge from the cycling domain (especially from the MBX segment) and the ski and skibob domain. 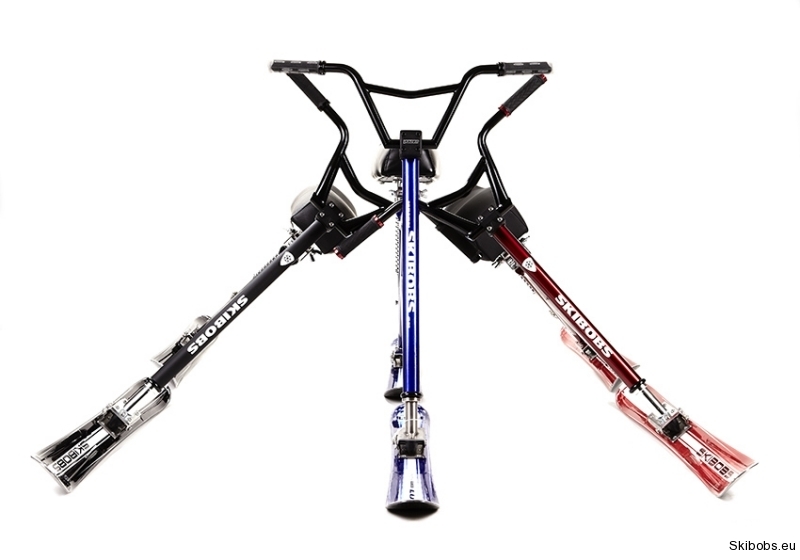 The carefully chosen diameters of frame tubes, the optimum angle of head tube, the optimal length of the upper frame tube, the clear and simple frame line, perfectly welded joints, and this all ensure the perfect frame function of our skibob. The engineers who participated in the construction of our skibob belong to the world top experts in this domain. A series of components of our skibob is made by the perfect machining using the CNC machines. We have entrusted the production of skis to the renowned company with long term experience of which skis are used also by the Czech skibob representation and some of German ski sportsmen. The seats of our skibobs are hand-made and sewn from the real leather or the hi-tech material used also for racing motorbike saddles. Handlebars, head composition, stem, grips, seat absorber, this all is chosen regarding the quality, your safety and comfort. Thanks to our responsible approach, cooperation with real professionals and to our nearly twenty years´ experience in the metal production, metallurgy and sport the really top product has been created. Although our skibobs are primarily determined for amateurs they conform to all criteria of FISB (International skibob federation). Material: Combination of the stainless steel and the premium chrome-molybdenum steel. 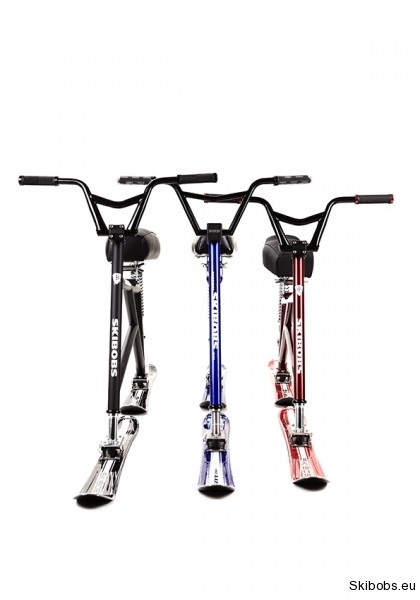 Handlebars: Quality BMX handlebars, due to the high seat to reduce the backbone load. 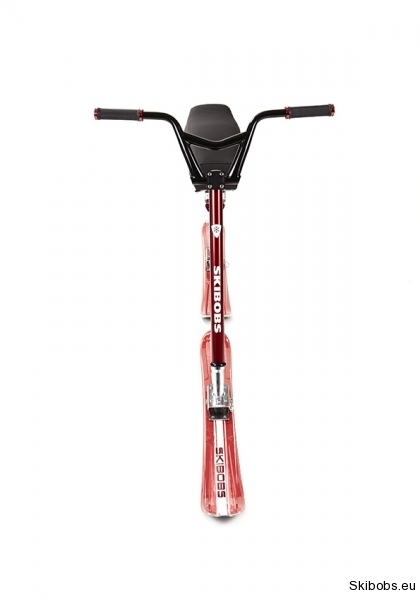 Absorber: Oil absorber with adjustable rigidity according to the style of riding and the weight of the rider. The maximum absorber lift is 8cm. Seat: Hand-made seat made of leather or hi-tech material used for motorbike seats. 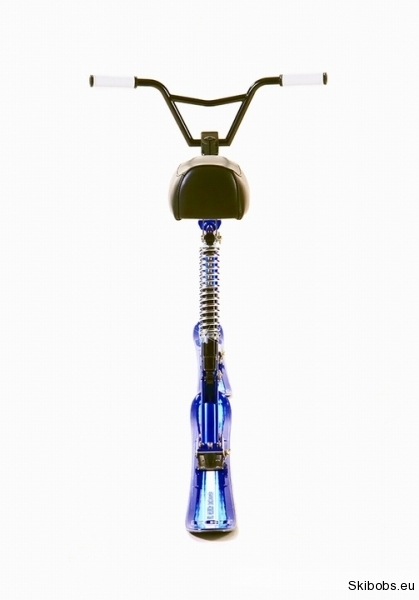 You can choose from two beautiful metallic colours (blue or red wine) and the luxury matt black. 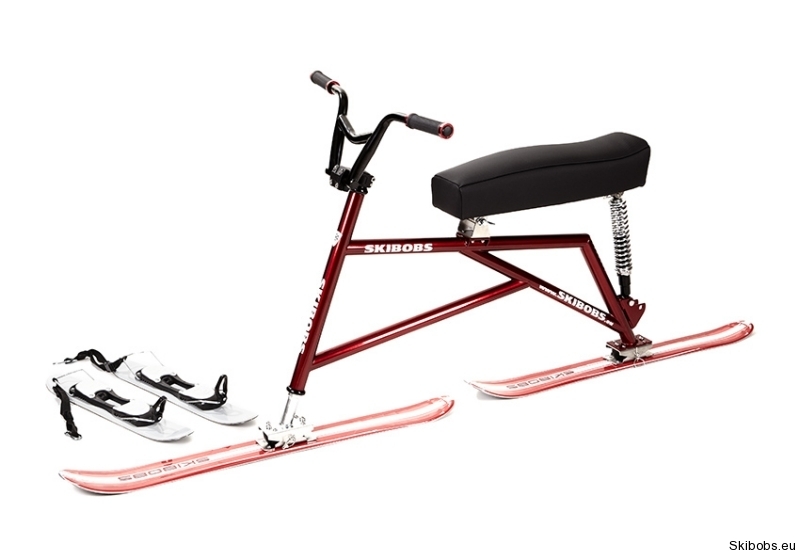 The delivery does not include the foot ski. 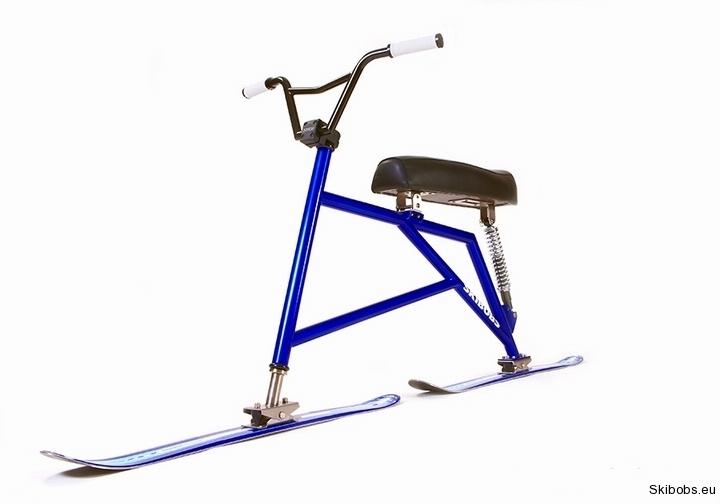 It means the mini skis fixed on the rider’s feet. These foot ski can be fixed on the absolute majority of classic ski shoes. 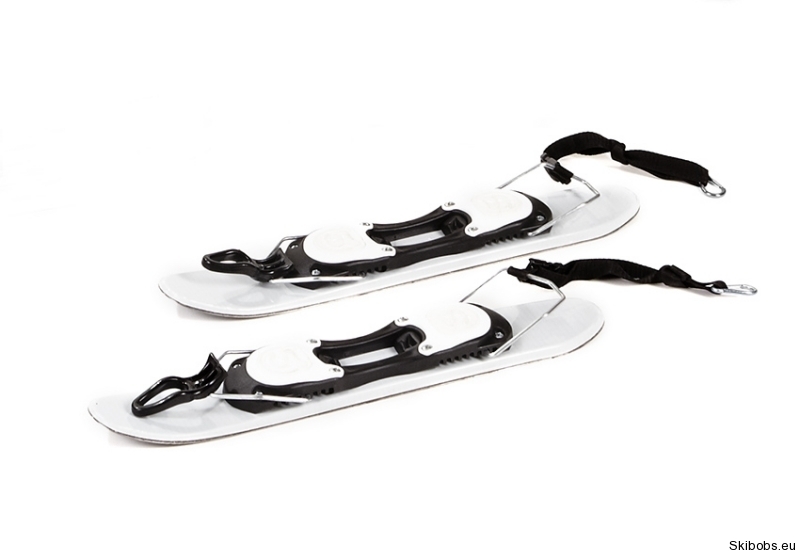 The length of these foot skis is 55 cm, the width is 88 mm. These skis have no diameter of carving, they are completely straight. Again, these are the professional skis used by our representation. 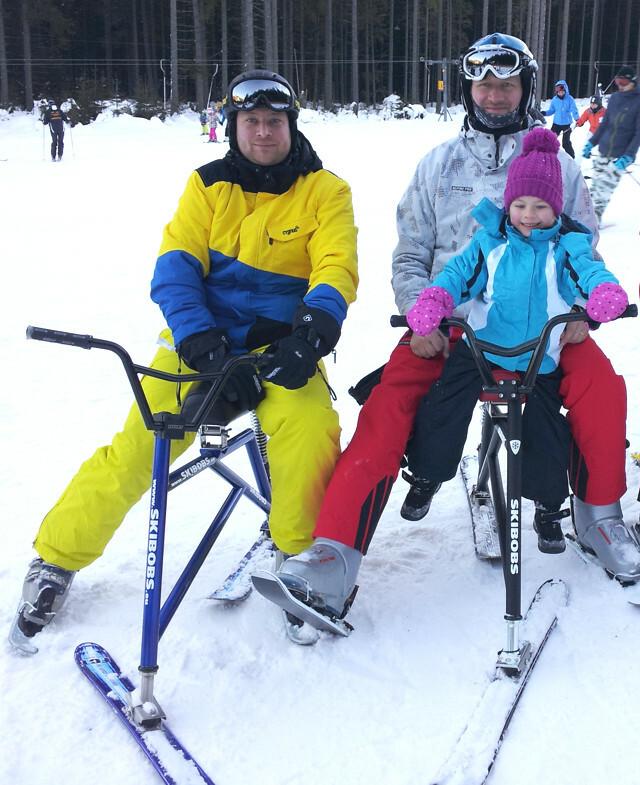 The price of our foot skis is CZK 2.500,-.